Easter is coming up quickly this year. I love Easter with its Mini Eggs (let’s be honest…any chocolate) and bright cheery colors! We go back to school for only 4 days after spring break before it is Easter and I always find this a great time to review concepts with my students. 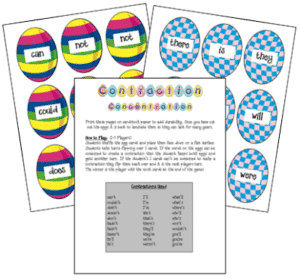 One of those concepts is contractions so this FREE contractions concentration will be part of my literacy centers. Students will have to match eggs to create 30 different contractions. They can either play this as a concentration game with a buddy or work on them independently. Click on any picture to get your free copy!